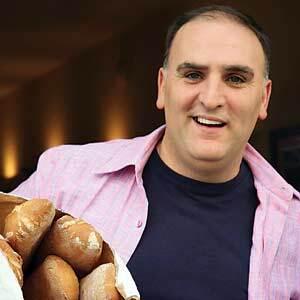 Jose Andres has a programme currently showing on PBS. I happily stumbled upon this in the listings and thought I’d give it a whirl. I watch anything involving Spanish food. I’ve spotted Senor Andres on Top Chef and he is known for his enthusiasm which manifests itself in much arm waving and finger pointing. The show focuses on a specific area of Spain each week where he visits cafes, restaurants and local farmers. An animated map pops up every now and then to show where he’s been and takes us back to his current home, Washington DC. This interrupts the flow of the programme as he doesn’t take the usual step of cooking in situ but creates his own version of a tapas classic in his US kitchen then exclaims “LET’S TAKE YOU BACK TO TENERIFE!” Cue arm waving, exit stage left. That seems to be his thing – he ends many a scene with “MMMMMMMMM! That was BEAUTIFUL!” and storms off. He also seems to be the luckiest man alive as every single thing he eats is the best EVER. Much lip smacking, eyebrow furrowing and groaning signals that he likes his food. In the first episode he spent time in Barcelona and San Sebastian then nipped back home to make his own version of pintxos. The more wacky part of this particular episode involved a camera looking up through a glass counter. No idea why. The most exciting part came with the obligatory visit to Arsak the legendary restaurant in San Sebastian. He kept being introduced to women! I counted at least five females working in the kitchen not including Elena Arzak, who runs the place with her father. We need more lady chefs. Another recent highlight was Jose’s visit to a banana farm in Tenerife where the bananas were HUGE and then, of course, he dashed back home to cook some lovely looking wrinkly potatoes MMMMMMMMMMMM, wrinkly [exits stage left].